"This useful reference offers in-depth coverage of current techniques for converting heavy oils and residues into more valuable distillates.Examines the chemistry of heavy hydrocarbon feeds and their properties important to engineering design, including phase behavior, reaction kinetics, and thermodynamic and transport characteristics!" Heavy Oil and Residue Properties and Composition; Thermodynamic and Transport Properties of Heavy Oil and Bitumen; Chemistry of Upgrading and Hydrotreating Reactions; Fundamentals of Kinetic Analysis of Upgrading Reactions; Residue Hydroconversion Processes; Thermal and Coking Processes; Fluid Catalytic Cracking of Residues; Hydrotreating of Cracked Products. ". . .cover[s] all of the important aspects of upgrading, from the chemical constituents of the feed to the commercially available processes that are practiced today. It does a good job, and it should be useful for. . .chemists in refinery laboratories, process and design engineers, and researchers. . ..There are practical problems at the end of each chapter that are good for either advanced engineering students, new practitioners in this or related fields, or those who want to brush up on the application of important concepts. " 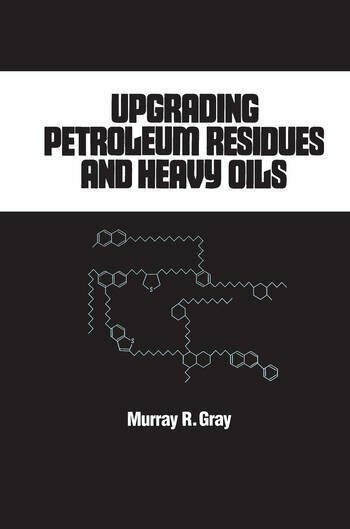 "This welcome and informative volume describes the process technologies now available for the conversion of the high-molecular-weight components of residues, heavy oils and bitumens to fuels and petrochemical feedstocks. . .. . . .Any reader requiring an account of residue upgrading need look no further. "